Sweet deligts - Learn to COOK & MEET new international friends! 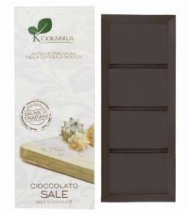 A choice of premium Italian sweet delights and boutique chocolates carefully selected by "Cook & Meet Emporio" directly by the producers and delivered to your doorstep. Ingredients: 55% hazelnuts from Piedmont IGP, sugar, dried skim milk, low fat cocoa powder, vanilla Bourbon, emulsifier: soy lecithin. Description: a superior nougat cream from the local Piedmontese variety of hazelnuts, "Tonda Gentile delle Langhe", hand picked and gently roasted directly by the orchard owner. Ingredients: 35% pistachio Bronte IGP, sugar, whole milk powder, vegetable fat, natural vanilla flavor. 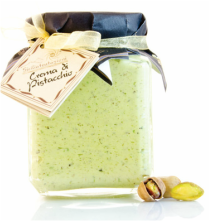 Ingredients: hazelnuts of the variety "Tonda Gentile delle Langhe" IGP (Protected Geographical Indication). Description: the Piedmont hazelnut is blessed by a delicate aroma and taste thanks to manual selection and roasting upon demand. ideal main ingredient for bakery and snacks, also paired with tasty cheese. Ingredients: bitter cocoa mass (at least 50%), sugar, marine salt grains.. Description: the village of Modica in sunny Sicily is synonymous of chocolate excellence. Imported from central America during the Spanish rule, is famous for the simplicity of its ingredients and the "graininess" of its consistency. Available in 18 variations of spices to please any ambitions or culinary imagination.